Things are moving on with CityCamp Chelmsford. Today we met at Anglia Ruskin University – Rivermead Campus to make further preparations. Pictured here is Philip, David, Ryan, Andrew and Steve. We met in the coffee shop area in the foyer of the Lord Ashcroft Building which is where the CityCamp will be held on Friday September 7th and Saturday September 8th 2012. We’ll also be using a 200 seater lecture theatre and eight breakout rooms nearby. Tickets are ready and waiting at the Eventbrite site. 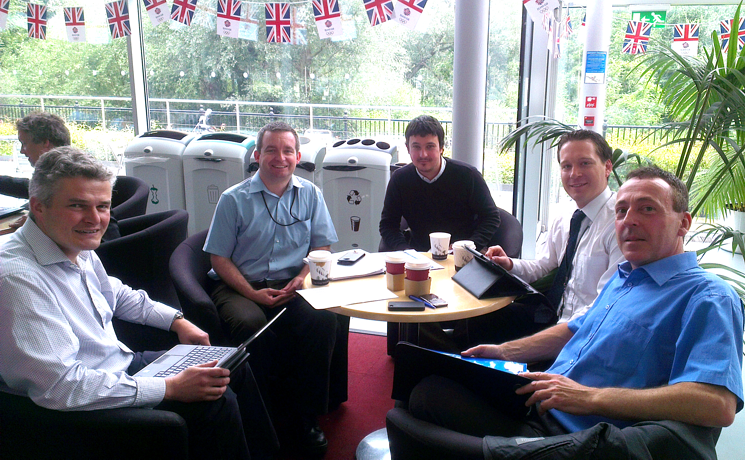 We’ve refined the arrangements after collaborating with the Chelmsford Ideas Festival being planned for October 2012. Friday afternoon will be an opportunity to listen to some inspirational speakers who will set the scene for the weekend’s activities, provide the backdrop for the CityCamp movement and present some case studies of what other CityCamps have achieved. There will be an opportunity to explore the area we’ll be using over the weekend, meet up and discuss your pitches and join us for the best of what Chelmsford has to offer with some freebies and discounted opportunities for evening food and drink. Saturday starts with a coffee before we gather for introductions and pitching. Pitching will take place and a matrix of topics and breakout rooms will be created. The rest of the day will be spent discussing the topics raised with a break for lunch. We’ll end at around 5pm when we’ll briefly re-cap before suggesting some opportunities for further ‘social’ networking with more discounted vouchers for food and drink in Chelmsford. The projects discussed will be incubated until the Ideas Festival which takes place between Saturday October 13th and Saturday October 20th 2012. During this week we’ll meet up again to hear some short presentations on the progress of the projects discussed at CityCamp before a panel of judges will award a special Chelmsford City Council ‘Grand Award’ of up to £1,000 to the projects they feel are most worthy of development. That’s all for now. Register to receive updates. We’ll be posting lots more updates with all the news over the coming weeks.